The geographical area delimited by the administrative borders of the Regional Province of Catania has some of the most interesting naturalistic features in Italy. Suffice it to think of the presence of the largest active volcano in Europe. Other elements lend uniqueness to the territory in question: here there are the two most important rivers on the island, it is bathed by a sea teeming with life, it has interesting geological structures and possesses peculiar fauna and flora. 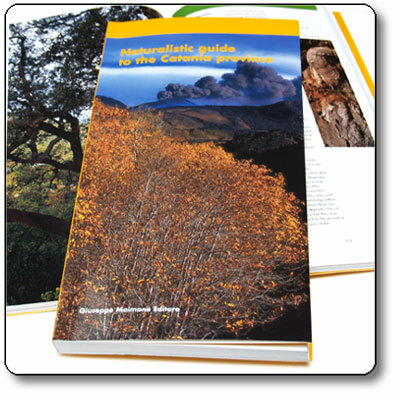 The guide presents several photos, schemes, maps and illustrations to discover the different areas and natural features of the Province: Mount Etna, Catanese Nebrodi Mountains, Catanese Erei Mountains, the Catania Plain, the fungi of the Catania Province, Catanese Hyblean Mountains, the coastline, the Alcantara and Simeto Valleys. For each zone some itineraries are described and traced on maps. A general map of the Province is at the end of the book, together with a list of the addresses and telephone numbers of the naturalistic institutions and groups working in this area.